ANNAPOLIS — About 130,000 uninsured Marylanders could receive health insurance in the next two years, said two state lawmakers floating a health care proposal Wednesday in Annapolis. 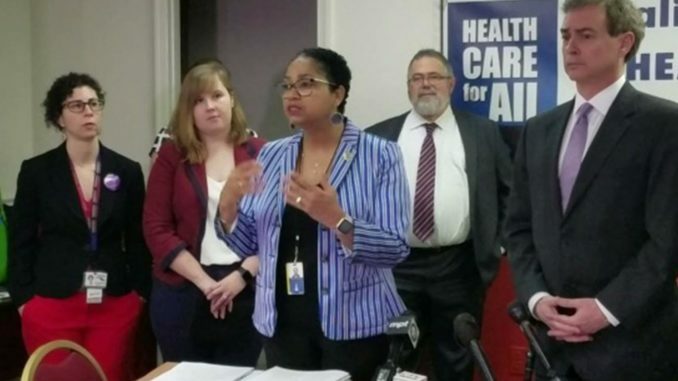 With the support of several health care organizations and advocates, Delegate Joseline Peña-Melnyk (D-District 21) of College Park and state Sen. Brian Feldman (D-Montgomery County) plan to use an individual health care mandate in the state. Their bill allows residents to make a down payment on an insurance plan or pay a $700 penalty during tax season. Either way, the lawmakers said, the money would be minimal and allows more people to receive health coverage. Tax refunds could be used to sign up for health insurance and forwarded to the state’s health insurance exchange to purchase plans. Feldman said the plan would help keep the Affordable Care Act alive in Maryland. The federal government stopped the requirement of the ACA’s individual mandate after a change in the federal tax code in 2017. He also said prior to the ACA, the state’s insurance rate stood at 12 percent. Today, he said, it’s been cut in half to 6 percent. The health care idea, which Peña-Melnyk said has been in the works for about eight months, came from Families USA, a health care consumer organization. Stan Dorn, a senior fellow with the D.C.-based Families USA, briefly outlined who would benefit in Maryland: 70,000 uninsured residents who have access to federal tax premiums; 50,000 could qualify for Medicaid, a program for low-income residents; and another 10,000 whose down payment could possibly cover most of their premiums. Dorn said states such as Massachusetts, New Jersey, Washington and Vermont and the District of Columbia implemented individual mandate requirements. However, Maryland would be the only state with an option to provide a down payment. “We see it as an important, national model,” said Dorn, who is also the director of the National Center for Coverage Innovation. Representatives for various health organizations such as the American Heart Association, Maryland Hospital Association and SEIU 1199 attended the press conference and applauded the “creative” proposal. “Our physicians see quite regularly, especially in the emergency rooms, people who come in with illnesses and ailments that could have been prevented if only they had access and if they had known they had access,” said Teresa Healey-Conway, executive director of the state medical societies for Anne Arundel, Howard and Prince George’s counties. Feldman’s legislation will be discussed at a March 6 hearing in the Senate, but no date has been scheduled yet for Peña-Melnyk’s bill in the House. Neither communicated with Republican Gov. Larry Hogan on this year’s proposal, but he worked with lawmakers last year on similar legislation that stalled. Hogan spokeswoman Amelia Chasse said the governor generally favors incentives over penalties.